Evil Genius Inc has a new member – Spawnling #3 arrived very early last Saturday morning. Figures. Ruining my weekend sleep-in from her first day. As with any spawnling, she now needs a name. In the same style as Sinister and Nefarious. So I thought I might open it to the minions, in the form of a competition. Suggest a nickname for Spawnling #3 in the comments below. 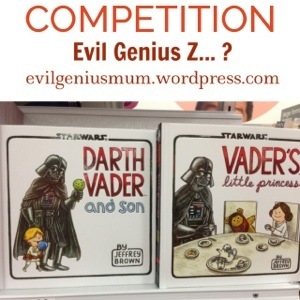 Evil Genius Dad will choose the best and award the prize – your choice of either of these Star Wars books: Darth Vader and Son, or Darth Vader’s Little Princess. Only rule is that it must start with the letter Z. Entries close 12 September, and the winner will be announced 15 September.